Gary and Candace chose Paradise Cove, Orlando for their wonderful wedding celebration. They chose it possibly because of the gorgeous beach front on which their ceremony would be held. That is the same beach front that presents an unblemished view of the water and unpopulated shoreline where Spanish Moss hangs from the tall majestic Cypress Trees, and Cypress Knees push through the surface of the water. They possibly chose it because of the fantastic group of planners on staff there! Or it might have been because of the great reviews Paradise Cove has on-line. Whatever the reason, they made a very wonderful decision. They also chose to utilize the recommended vendors that Paradise Cove depends upon for great service and dependability. Lon Tosi from Celebration, Florida, of the Orlando Team of Officiants from Sensational Ceremonies worked with the couple to build a custom wedding ceremony that had the audience crying with tears of joy. 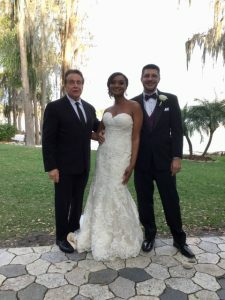 Their ceremony focused on “love” and emphasized the fact that “destiny” had brought them together and that their “love” adventure has just begun. Blossoms Orlando provided the outstanding florals for the event. And the award winning Castaldo Studio worked to capture the entire event on camera! We can’t wait to see the photos! The bride and groom were so photogenic! John Michael Catering had amazing foof on hand for the cocktail and wedding receptions. Their was a photo booth provided by Photo Booth Rocks, on hand to capture those “wacky” moments forever, and Our DJ Rocks provided the sound and entertainment for both the ceremony and reception. They always bring the house down with their talented DJ’s. Publix provided a multi-tiered cake for the occasion. Their icing is to “die for”. And last, but not least, Faces By Shannon had everyone looking their best for the “big day”! The title of this blog indicates that the day was sunny. It was indeed! Everything about this celebration of love was sunny and amazing! We at Sensational Ceremonies wish you much luck and happiness with your marriage Gary and Candace!